With all the talk about health care reform these days, I thought it would be fun to take a look at how people in the past viewed the health care field, in art of course: apparently not that differently from today. Parodies, satires, and downright cartoons about the medical profession have been popular in the West since the Middle Ages (c1000–1400). Rampant in these images of doctors — most notably the popular medieval “Dance of Death” series, where death in the form of a skeleton seizes all strata of society — is the perception that doctors consider themselves something of demi-gods among humans. 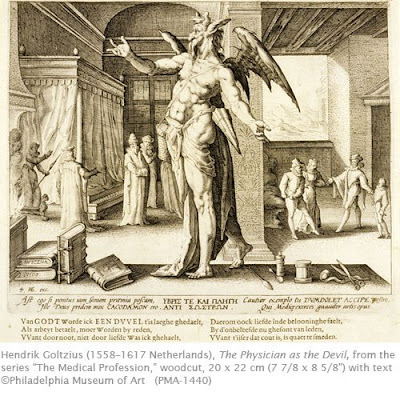 To look back at a Renaissance image of the medical profession, I chose my favorite Mannerist printmaker, Hendrik Goltzius. Apparently doctors’ fees were not any better during the Renaissance than they are now. Mannerism was a late Renaissance style. It was a somewhat conscious rejection of the stifling, classically-inspired High Renaissance emphasis on balance, perfection, and calm that had dominated art the first third of the sixteenth century. Mannerist artists preferred dramatic diagonals, elongation of figures, soaring spaces and open compositions. Some of the more prominent Mannerists were El Greco, Parmigianino, Bronzino, and Pontormo. The style originated in Italy, but spread quickly to northern Europe because of the increase of contact between northern and southern artists during the sixteenth century. Goltzius was the preeminent printmaker of the sixteenth century in the Netherlands. Like Albrecht Dürer in the early sixteenth century in Germany, Goltzius is known primarily for his printmaking oeuvre. He produced this at a time when prints were gaining in popularity as fine art, a trend set by Dürer and Lucas van Leyden earlier in the century. In fact, during Goltzius’ times, the first museums were established that featured primarily graphic arts, and not just copies of paintings. Goltzius greatly admired Dürer’s compositions and style, and, like Dürer, was a master at using the burin, the tool used to gouge metal plates or wood blocks for prints. He achieved this proficiency despite the fact that his right hand had been stiffened due to severe burns he had suffered as a child. This print comes from a series that documented the various perceptions of doctors by patients. The first of the series was as a “god or angel,” because the physician arrives when the patient is suffering. The next is “as a man or friend,” caring for the patient during recovery. This is the last of the series where the doctor seems to be a demon, surrounded by the tools and books of his profession. The doctor is demonized, because the patient has recovered and the doctor has come to collect the fee. The print does gorgeously show off Goltzius’ printmaking abilities, with the fantastic texture created by the cross-hatching. The soaring interior space with the oversized bed, attenuated figure of the demon/doctor, awkward scale of the background figures, and emphasis on the diagonal placement of the doctor’s arms are all elements of Mannerism.